In this guide we’ll take a look at some the best studio monitor speakers for recording, mixing, and mastering in the home studio. Quick answer: the Yamaha HS5 offers the best value for money, while the Mackie CR Series CR3 the cheapest you can get without without compromising on quality. But if you’re looking top-notch, the Adam Audio A7X will do for all your monitoring, mixing, and mastering requirements. Update notes: For 2019 we continue to recommend the Yamaha HS5 as one of the best choices you can get. With the Adam Audio A7X being your choice if you want to take quality a step further, and your budget can handle. 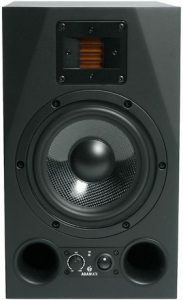 However, JBL LSR30 has been replaced by the 308P MkII, which is the newest studio monitor on this list to be released. 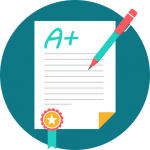 Take a look to see what we have to say about it. If this is you first time buying studio monitors, take a look at the buying guide and FAQ section, where you’ll find the best information on all you need to know about studio monitors, and how to find the best one to buy. We attempt to bring these choices down to a simple buying decision. The Yamaha HS5 studio monitor is a professional speaker for critical listening that comes at an affordable budget. These monitors are very good, with lots of positive reviews from professional users, as well home studio owners. The ideal user is any kind of music producer or mixing engineer who wants the most honest sound they can get for the money, with flat and unhyped frequency response. The result: the Yamaha HS5 will ensure that your mixing translate well, no matter where you play your mixdowns, whether in the car, or on your cheap stereo. 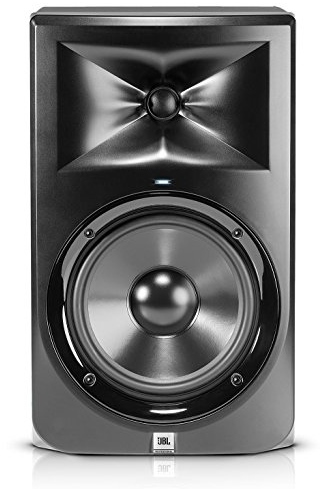 For that reason, these are one of the best studio monitor speakers for the money. The Yamaha HS5 is a powered bi-amplified monitor, with a 5 inch low frequency woofer cone, and a 1 inch high frequency tweeter dome. You can get a frequency response of 54Hz to 30kHz, and maximum power output of 70 watts per speaker (140 W total). The crossover frequency is at 2 kHz. With Room and High Trim controls, you can trim low and high frequencies to suite the room you place them in, or contour high frequency response. For instance, attenuating the low frequencies to respond well to being place next to walls that may otherwise lead to unnatural bass sounds. This HS5 is a modern monitor that was created as an update to the Yamaha NS10 (great article on the history of them at Sound On Sound). 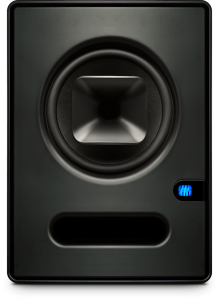 The NS10 is always referenced as highly rated studio monitors. Particularly because they sound so flat that it was borderline unpleasant. If you can get a good mix on them, your music will sound good anywhere. They were discontinued (the NS10 dates all the way back to the 1980s, and could be found many pro audio studios since then) and Yamaha made the HS50M instead to as a replacement for them. But being faced by competition, Yamaha decided to improve the design, try for a flatter frequency response, improved the bi-amp, make a tighter low end for more powerful bass, and a larger tweeter for more accurate highs. What Yamaha gave us is the the HS series. In this guide, I've featured the HS5, but there are also 5.6 and 8 inch version as well (available at the same link). The HS5 then are regarded as excellent monitor pairs to for critical listening. On their own, if you can get your music sounding good on these, you can get your music sounding good on anything. If something is wrong, they will let you know, and might not be very nice. But on these you can at least find out where things go wrong quality, and fix them instead of guesswork and theoretical audio engineering applications. That said, they don't sound as unpleasant as the 80s original, so you wouldn't have to suffer from fatigue. But the ultra-flat response ensures that what you are mixing is truly professional. Bottom-line, the Yamaha HS5 is great for music producers and engineers alike. If you produce music, but want to do your own mixes and even masters, a pair of these is the best affordable option for you. Otherwise, if they are great on any kind of music you want to make, mix, or record. 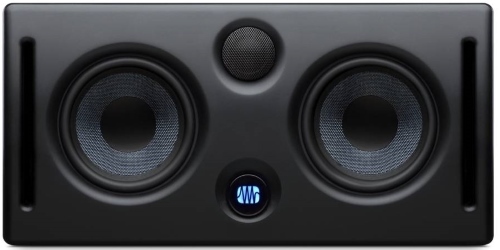 The Mackie CR Series CR3 studio monitor are branded as "Creative Reference Multimedia Monitors" by the manufacturer. It's intended purpose is to be a great sounding monitor for working on any audio based media. So if you do animation, video games, Youtube videos, etc., these monitors would be a great choice for you. Also if you work on podcasts. But that doesn't stop this from being very widely used as a studio monitor for music production, and even mixing. On top of that, it is cheap, dirt cheap. But among all the cheap studio monitors that I could find, this offers the best sound quality of practically of anything at the this price range. These are powered monitors, with a 2-way configuration. The low-mid frequency driver is a 3 inch polypropylene coated woofer. It's not going to give earth shattering bass, but for its size, it offers a surprising amount of low-end that can be suitable for mixing and making music. Expect the woofer to respond to frequencies all the way down to 80 Hz. The high frequency driver is a 3/4 inch silk dome ferrofluid cooled tweeter. It will provide an accurate frequency response up to 20,000 Hz. The monitor has sufficient power, too. 50 W is its peak output, totalling 100 W for the pair. The crossover frequency (between the HF and LF drivers) is 3kHz. You can also plug you 1/8" headphones into it for when you decide to use your studio headphones. Users have reviewed this monitor as very good. One owner said that he thought these were just going to be just a little above average the consumer computer speakers. He has gone on to find them a great referencing set for doing his mixes. This is because the CR Series CR3 has a very balanced and smooth sound which is neither unpleasant, nor dishonest. Many then have found that the monitors are great as a "B" set for referencing against their more high end monitors, providing a more balanced analysis for critical listening. However, they are also perfect for music producers and composers who are more interesting in creating music on something that sounds good. Bottom-line, a great pair of monitors. Very cheap, and one of the best studio monitors for under 100 out there. If you were looking for a budget monitor, you may have found your pair. The Adam Audio A7X studio monitor is a professional-grade monitor speaker that's one of the most recommended and reviewed among users in forums online. It has a compact design that makes it very suitable for a small home studio setup, with a few useful controls to contour the sound to your critical listening preferences. 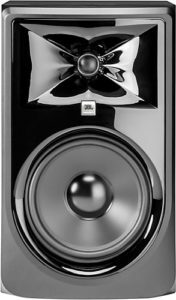 But perhaps one of the most impressive aspects about these monitors is that, despite their size, they are powerful, with powerful yet accurate bass extension. But it's not just a bass heavy monitor, it's well balanced, and accurate, making it an excellent choice for any kind of sound designing, mixing, mastering, as well as beat making and recording projects. The Adam Audio A7X studio monitor uses a bi-amplified system to drive the woofer and tweeter. It's a 2-way configuration with a maximum output of 150 Watts (that's 300 Watts for the pair). The 7 inch low frequency woofer is made of carbon fiber composite of rohacell and glass fiber. The woofer can give you powerful and accurate bass extension all the way down to 42 Hz. The high frequency driver is an X-ART ribbon tweeter, with a high-end extension of an amazingly high 50 kHz, one of the highest on this list. This super high frequency extension makes these monitors great for working on orchestral and acoustic music, as well as mixing drum cymbals since there will be so much of those higher harmonics being reproduced. At the front of the Adam Audio A7X studio monitor are monitor controls, one for tweeter, the other for main volume. Plus you have the ability to attenuate the high and low frequencies with the high/low shelf controls. The bass ports are found at the front, which accentuates the fact that these monitors are designed for a small space. You wouldn't have much difficulty mounting this in your room, as the bass ports won't cause any unnatural bass effects from being placed in a corner or near a wall. Only main downside is that the cabinet is not shielded from electromagnetic interference, so you would have to keep that in mind. The Adam Audio A7X studio monitor is one of the most highly praised monitors by users, and certainly one of the best for money. They are described as highly accurate, clean, and clear, with a massive sound stage. For that reason, the ideal user is anyone from a sound designer, to a mastering engineer. The only negative thing that I could find was that they are sometimes considered a little "bright" in some applications. But this is often the result of the fact that the tweeters on the A7X are so responsive and accurate that the surprising amount of responsiveness in the high-end may give the impression of brightness to the untrained ear. Expect the bass to be very accurate as well. It doesn't go sub-bass level low, but the accuracy of the low end will be able to catch any inconsistencies in your bass mixes. In terms of sound, they are not "ugly" nor unpleasant, despite the fact that they have a very flat and accurate response. But they will make low quality recordings and improperly mixed music sound ugly (like MP3s). And that's exactly what you want from the best studio monitor speakers -- a stern, uncompromising clarity of a disciplined schoolmaster that will steer you in the correct direction, and reward you for your good results. Bottom-line, the Adam Audio A7X studio monitor is a great choice that definitely will not disappoint you. If you can get over the lack of a shield, what you get is one of the most truly accurate sounding monitors specifically designed for any aspect of music production there is, in a compact size for a small production space. The PreSonus Eris E series studio monitors are a line of high quality profession studio monitors designed to be as true and flat as possible, while remaining comfortably affordable. For that reason, they are very popular and highly rated among those who've used them. In the line, there are many buying options: 3.5, 4.5, 5, and 8 inch variations, plus two horizontal versions that offer an extended frequency response. In this guide, we're taking a look at the PreSonus Eris E44 studio monitor, which is an affordable, dual woofer configuration that gives you four powerful woofers in one pair. The PreSonus Eris E44 studio monitor is a bi-amped, 2-way powered studio monitor speaker, that has two low frequency drivers and one high frequency driver. The low frequency drivers are 4.5 inch custom-woven Kevlar woofers both, with the potential to extend all the way down to 55 Hz. The positive benefits of the dual midwoofer configuration is that you get a wider stereo field. Despite being a near-field monitor, this offers you one of the largest stereo image in this class, and for this price range. The high frequency driver is a 1.25 inch silk-dome tweeter that can reproduce smooth high frequencies going all the way up to 22 kHz, without causing any listening fatigue. The combination of all three drivers equals to maximum power output of 90W. Slap two of these together, and what you'll have is 180 watts of power. 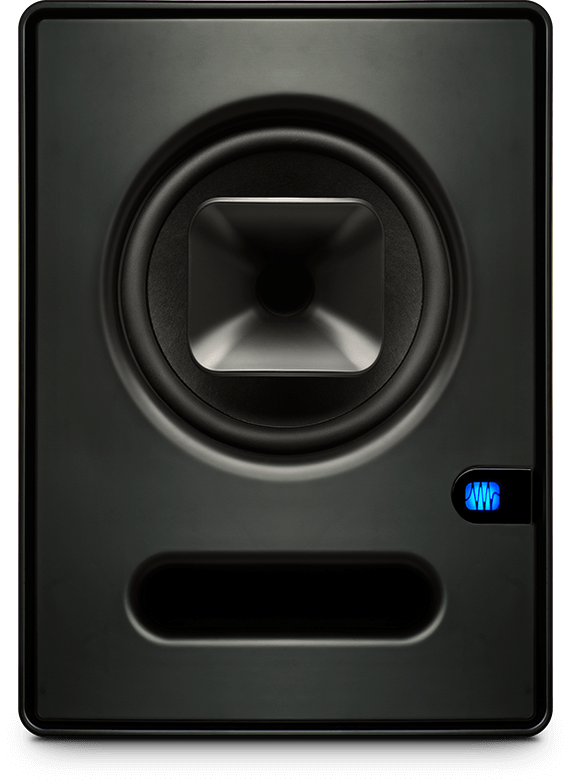 The PreSonus Eris E44 studio monitor is considered the answer to the "poor home studio" sound. We are familiar with this, listening to demos by producers can give you a fairly accurate idea of what level of equipment they are working with. The PreSonus Eris E44 studio monitor is really "cheap," if you consider cheap to be 100 or 200 dollars for a single monitor, but they provide a sound that can give you results akin to a high end recording studio. Hence, the ideal user would be a home studio owner who's looking for an unfatiguing studio monitor that sounds good, honest, flat, and translate well across other speakers. This could be record producers and beat makers/composers of any kind of music, as well as recording and mixing engineers. The design is very well done, in my opinion. They look processional, but they are also still beautiful. If your creative space is a little more on the "chic" side, these could certainly find a home. And if not, they don't look so outlandish that they beg more visual attention than sonic satisfaction. The enclosure is of a ported designed, and made of a vinyl laminate. Like practically any other studio monitor, the woofers are exposed, displaying their beautiful woven Kevlars. And the front facing bass ports mean you have less issues with their placement in a room with running the risk of an unnatural bass sound. 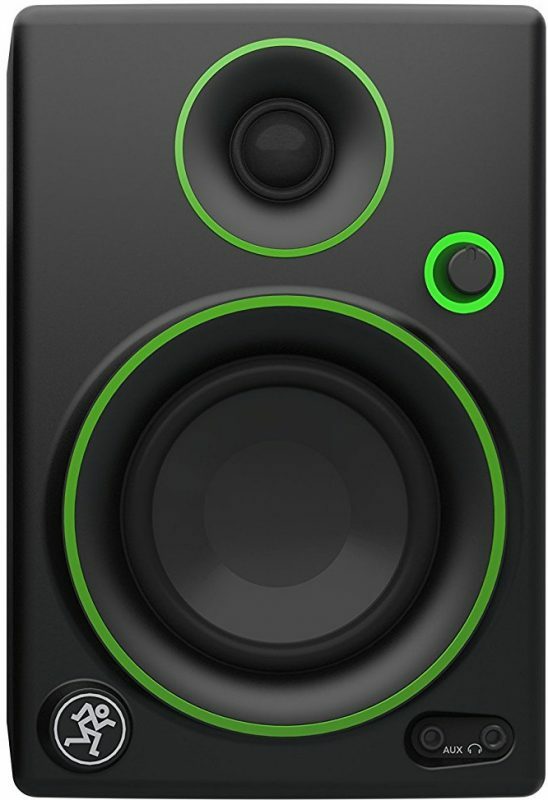 Bottom-line, these are great studio monitor speakers for the money. They pretty much fall in a happy middle of cost and quality, unflattering honesty and great sound. It's not expensive, yet not cheap. And it certainly will help you to make and mix better quality records in the future. 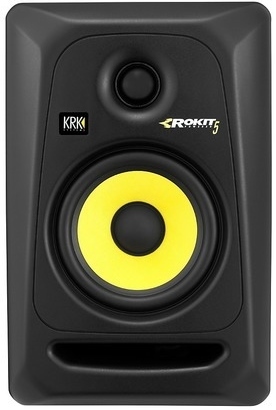 The KRK Rokit 5 G3 studio monitor are one the most popular monitor speakers. You see them everywhere, and are perhaps the first thing most people think of when they look up for best studio monitor speakers online. For that reason, the Rokit is often the first pair of monitor speakers a producer or engineer gets when they just starting their own home studio. So it's safe to say that these are great "beginner's monitors." They are affordable, sounds good, and offers a nice compromise that's unique to the Rokit. But it's not just popular among beginners, they are found just as often enough in professional and high end studio as well. The Rokit 5 G3 is a powered studio monitor, with a bi-amplified 2-way configuration. The 5 inch woofer will drive your mid-range and low-end frequencies all the way down to 45 Hz. The high frequency driver is a 1 inch dome that can reproduce frequencies up to 35,000 Hz. Both drivers total a maximum output of 50W, with 100W when you combine the pair. While the KRK Rokit 5 G3 studio monitors can get pretty loud, it's volume level is sufficient for recording and composing music without reaching earth shattering volume levels, and works best when critically monitoring your mixes at lower volume levels. The KRK Rokit 5 G3 studio monitor has a beautiful design, with yellow woofer drivers, and a black curved body. It's footprint is also not that big, at 7.4 inches wide, 9.7 inches deep, and 11.2 inches high, you can easily find a place for them in your setup. 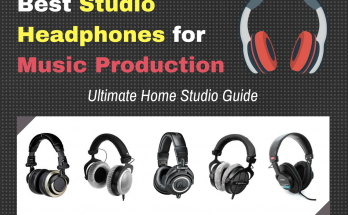 In the buying guide portion of this post you'll read that the purpose of a good studio monitor is to provide a flat response across the frequency curve, giving you transparent sound so you can mix well? Well the result of that is usually an unpleasant and even an "ugly" sound to the untrained ear. Especially in "budget" studio monitors. Hence, when producers are just starting, they usually reach for something that's a bit of a compromise. The KRK Rokit 5 G3 studio monitor is that said compromise between "unflattering honesty" and a pleasant listening experience. This is good for a couple of reason. Newbie producers won't be thrown off when their productions don't "sound like" the sort of music they like to play on consumer speakers. The second reason is that they have slight bump in the lower mid-range of the frequency range. Speakers of this size tend to be weak in the bass, meaning the necessary addition of a subwoofer. With the KRK Rokit 5, you may not even need one, and so make a good starter pair for your home studio for making music. Bottom-line, the KRK Rokit 5 G3 studio monitor are an excellent choice if what you are looking for is a nice compromise between unflattering honesty and pleasant working experience. Also if you are new to music production and looking for "first speaker monitor" for your home studio. You won't be disappointed either way. Especially so with the quality, as their popularity speaks for themselves. The JBL 308P MKII 8” studio monitor is the latest in JBL’s celebrated 3 Series, which made waves in the audio world by offering unparalleled quality and versatility at an affordable price. This latest incarnation now features an 8” woofer for enhanced bass reproduction. The trademark 3 Series clarity, detail, and precise imaging are still present, along with the superior dynamic range that made the earlier models such popular choices among studio, film, and broadcast professionals the world over. The MkII represents a significant improvement over earlier JBL speakers in many ways. It now has a sleek and modern design, and the transducers themselves have been improved for enhanced sound quality and transparency. The 308P MKII boasts of the innovative Image Control Waveguide technology, which was developed for the company’s high-end M2 Master Reference Monitor. This particular feature gives the 308P MKII outstanding depth and detail, which really come to the fore when mixing. Image Control Waveguide provides a seamless transition between the monitor’s low- and high-frequency transducers, resulting in a pleasing soundstage with precision imaging. You will find that the 308P MKII has a very broad sweet spot and a frequency response that is remarkably neutral. You therefore get a clear and precise representation of your audio, with details revealed in startling clarity even during off-axis monitoring. Bottom end reproduction is clearer and more accurate than ever due to the long-throw 8-inch woofer and JBL’s own Slip Stream low-frequency port. Bass is deep and tight, while the highs are crisp and present without being too harsh. The 308P MkII features dual-integrated Class D power amplifiers that are designed specifically for each transducer. Features such as the Boundary EQ and the 3-position HF Trim switch enable you to compensate for any listening environment. Some of the 308P MKII’s more enthusiastic users have no qualms about proclaiming these as the best studio monitors in this price range. The clear and accurate sound reproduction has made quite a few fans among music producers and film audio engineers, and they are even widely used in home entertainment systems. Some users did feel that the 308P MKIIs aren't the absolute best in terms of clarity and neutral frequency response. Nevertheless, most seem to feel that they have a pleasing sonic quality to them, without the tinny character associated with most home entertainment speakers. Others also feel that the bass tends to be a bit muddy when boosted, although this isn't a sentiment shared by most users. Bottom-line, at the price that the 308P MKII’s are going for, you would be hard-pressed to find a more versatile and capable set of monitors. The frequency response is reasonably flat and neutral, and you could only hope to get significantly better performance by spending a lot more money. As it is, the JBL 308P MKII 8”s are a worthy addition to the respectable JBL 3 Series. The PreSonus Sceptre S6 studio monitor is a coaxial monitor speaker released as the company's next generation monitor system. It includes some improvements and new features upon an already high quality system, like a dual-core processor, DSP, acoustic-adjustment controls facilitated by 32-bit, 96kHz audio processing, and advanced Temporal Equalization technology. The result is perhaps the best high resolution panoramic soundstage and detail for the money, even if you're home studio is a somewhat less-than-ideal setup. For that reason, these monitor speakers can be found in the homes and studios of serious home studio owners. The PreSonus Sceptre S6 studio monitor is a powered 2-way monitor system. The drivers are bi-amplified, with a 6.5 inch low frequency driver with a bass extension of 42 Hz. The high frequency driver is a 1 inch tweeter horn, coaxially positioned in the center of the low frequency driver's woofer axis. This has a high frequency extension of 23,000 Hz. The coaxial positioning has some really great benefits. But the best reason is that you have a wider "listening sweet spot," as both drivers are pushing frequencies at you from the same position. The maximum output for the PreSonus Sceptre S6 studio monitor is 180 watts (90 watts for the low frequency driver, 90 watts for the high frequency driver). But when you use them as a pair, you have a massive 360 watts. This means very good monitoring levels can be achieved at louder volumes, making it a great choice if you do any mixing and mastering in your studio. You can configure the monitor to suit your space as well. The PreSonus Sceptre S6 studio monitor has Acoustic-tuning controls which let you tune your monitors to your room. You can also utilize the "CoActual" technology for DSP time-correction to fit your space. The coaxial design affords a compact arrangement for PreSonus Sceptre S6 studio monitor a well, giving it more room for PreSonus to place the bass port at the front. The bass port position makes it easier to mount this monitor in a small room, where a wall or corner nearby would otherwise compromise the sound quality. The design is also quite beautiful, in my opinion, as it has a modern, unassuming, professional look to it. It is all black, with just a blue light that shows you the PreSonus logo when the monitor is active. Bottom-line, the PreSonus Sceptre S6 studio monitor is a great sound design and mixing tool for your home studio. In the word of one pro-audio customer, it sounds like "magic." It has a truly professional sound that is neither unpleasant, nor inaccurate. It is credited with a large and deep sound, with a full lower-end, allowing you to accurately mix your bass without any guesswork. Expect it handle all you need for recording, creating, sound designing, mixing, and mastering. The Neumann KH 120 studio monitor is a mastering-grade monitor speaker system. You may be familiar with Neumann as the maker of some of the highest quality microphones. So you can expect that the same level of engineering and precision from the German manufacturer was put into these great studio monitors. As nearfield studio monitors, they are particularly good for any studio application, whether you plan on recording, mixing, mastering, or doing any broadcasting or any kind of post-production work where good audio quality is paramount, upfront and personal in your workflow. The "KH" in the name means "Klein+Hummel," a German company very much associated with high quality, professional grade monitoring. It was acquired by Neumann, and result is their KH 120 model. WIth it, you get a 2-way bi-amplified powered studio monitor, with a long-throw composite-sandwich 5.25 inch low frequency woofer that has a bass extension all the way down to 52 Hz. The high frequency driver is a 1 inch titanium-fabric dome tweeter that can extend all the way up to 21,000 kHz, without causing listening fatigue. The KH 120's frequency response is considered smooth and natural, with an incredible bass that is surprising for the compact size, which is very detailed and revealing. The Neumann KH 120 studio monitor is a special favorite among producers, mixing engineers, and mastering engineers for its clinical precision. They provide a flat and clean sound that is not fatiguing (like the Yamaha NS10). Yet at the same time, they don't "flatter" your music so much like a KRK. For that reason, they make very good monitors for polishing your mixes and providing good masters. Expect one of the most accurate sound you can get from a studio monitor at this price. Making EQing decisions are easy with the KH 120 because everything is so revealing. A pair of these monitors also take the guessworSceptrek out your stereo imagining and designing your soundstage. In addition to that, if you are monitoring in a less than ideal studio environment, the "Elliptical Mathematically Modelled Dispersion" (MMD) waveguide technology will help smooth out any off-axis responses. The Neumann KH 120 studio monitor doesn't disappoint (in my research) any of the people who has tried, tested, and bought them. The design is also practical. The bass ports are faced at the front, to make mounting the Neumann KH 120 studio monitor easy. There are 4-position trimming controls on the back that allow you to contour the low, middle, and high frequencies based on the your acoustic environment. It is in a sturdy all black, painted aluminum cabinet, with anthracite finish. Everything is black, except for the logo. These makes these monitors really hide out of site, and not as fancy as a few other monitors may be. Bottom-line, the Neumann KH 120 studio monitor is ideal for you if you want a pair of high quality monitors that can do it all. Tracking, mastering, mixing, broadcasting, etc. This is the industry standard, so you can't go wrong with that. The Adam Audio A77X studio monitor is a near and mid-field dual woofer monitor speaker system, with a sub bass extension, tri-amplified design, and a horizontal orientation, all which gives you one of the best stereo images you can get from a monitor for this money. It has one of the best stereo imaging of it class, with a very cool monitor specification that splits the frequency range for better crossover accuracy (more on that soon). It was created using state of the art technology, with German handmade material. These speakers were designed specifically for people who want to get detailed mixes and masters, without any second guesses in their work. The Adam Audio A77X studio monitor uses 3 drivers per monitor, with a 2.5-way system. The arrangement of the monitor system makes it that one monitor accurately reproduces the "left" channel, and the other monitor the "right." So a careful purchase of a "right-left" pair is essential. The low frequency drivers are dual 7 inch woofers, both of them extend all the way to 38 Hz for sub bass monitoring. However, at 400 Hz, one of the woofers fades out and the other woofer continues the midrange up to 3,000 Hz. The purpose of this is to prevent interferences and phase cancellations in the critical midrange frequencies. For this reason, the monitor is consider a 2.5-way system instead of 2. It also uses an X-ART high frequency 1 inch ribbon tweeter that drives up to 50,000 Hz. The result is a very wide frequency range spread suitable for all sorts of sound design and critical listening. The Adam Audio A77X studio monitor is driven by tri-amplification, with each driver having its own dedicated amplifier. The maximum output then is 225 watts, or 450 watts total for the pair. The materials used are high class. The woofer cone is made out of a carbon fiber composite of rohacell and glass. The bass ports are placed at the front as well, which help to make mounting the speaker monitor in a treated room (idea) without any hassle. The design is also beautiful and professional, in my opinion. The general consensus is that the Adam Audio A77X studio monitor is amazing. What makes it amazing is the level of detail that this can give you. The ribbon tweeters are fast and will produce every high frequency you want to hear in your audio, particularly if you work of orchestra and acoustic music. The low frequency drivers take you all the way down to where you need to monitor your bass and kick with accuracy. Because of the configuration it offers a near to mid-field listening range. What you have then is a massive soundstage, meaning that the Adam Audio A77X studio monitor will fill your room with sound as if they were objects hovering in space. This is the detail of the sonic precision that these speakers offer. And that's why they are so coveted among mastering and mixing engineers. On top of that, they are certainly not unpleasant to listen to. A bad or mediocre mix will punish your ears, but you will know exactly what compression or EQing does not work, and fix them without any guesswork on your part. The result is a smooth and clear sound that you can take pleasure in working with. Bottom-line, the Adam Audio A77X studio monitor is, again, another great studio monitor speaker. It costs some money, but if you can afford it, it will be worth it and will not disappoint. They are suitable for any genre, though sound designers, mixing, and especially mastering engineers will benefit the most from this system. The Focal Twin6 studio monitor is a near to mid field professional-grade speaker system with a horizontal orientation and a uniform 40 Hz - 40 kHz frequency response. 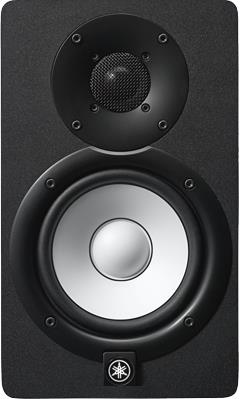 These one of the most popular high end studio monitors on the market, and are, in fact Focal's best selling speakers. Most people who are "in the know" know about these Focals, so a true "best studio monitor speakers" guide would be incomplete without at least one Focal, with the most popular one making this list. Those who buy these are primarily professional and enthusiast home studio owners looking for uncompromising sound reproduction. Particularly when it comes to sound design, mixing, and mastering work. There are a few audiophiles too who love these. The Focal Twin6 studio monitor is a 3 way studio monitor. It features two 6.5 inch woofers and one tweeter. The woofers are split into mid range and sub bass, driving 150 watts of power each, and the tweeter driving 100 watts. (Total power output for the pair is 800 watts). The woofers are a "W" composite sandwich cone, giving clear and transparent bass frequencies all the way down to 40 Hz. The high frequencies are driving by a Hallmark-Focal inverted-dome Beryllium tweeter, which can extend all the way up to 40,000 Hz. The Focal Twin6 studio monitor also features a potentiometer for adjusting the tweeter and woofer levels, a voltage selector, and input-sensitivity selector. It also has an transducer shielding using cancellation magnets. Unique to the Focal Twin6 studio monitor is the 3-way design that enables a more neutral midrange. And this is what makes them excellent for mixing in particularly. Those who have used it have found the bass frequencies to be highly articulate and accurate. There isn't any hyping involved, just a smooth and honest bassline that translates well. The high frequencies are also very impressive and detailed, lots of precision will cut away any guess work in your workflow. That said, these monitor do not sound "bad," users find that they are a pleasure to work with, providing a rewarding experience that pays for itself in the end in terms of money and also time it takes to get your mixes to sound right. The design of the monitors are beautiful, in my opinion. The exposed gray woofers, and inverted cone are pleasing to the eye. The cabinet has a dark natural red veneer finish, with a black body. It doesn't look like just another pair on studio equipment in your room, but also a piece of elegant professional furniture. For that reason, these monitors also find a home in many audiophile living rooms. Plus it's understated, with smoothed out corners that really give these a nice soft touch in a studio. Who says professional studio monitors can't be attractive? Bottom-line, Focal Twin6 studio monitor are one of the best studio monitor speakers on the planet. If you can afford them, get them. They work for practically any application, pre or pro production, film, mixing, mastering, composing, beat making, sound designing. software which you cannot run without a good laptop or computer. Then, you can't leave out your audio interface. The little device that ties everything together so your equipment can communicate with each other. And with all that gear, you would not be able to hear a single thing. Why? Just like every other piece of equipment in your home studio, the choice of monitor makes a difference in how good your music will sound. So in this guide, we'll investigate the best studio monitor speakers. And we'll choose from the brands and products that are most recommended. What is a studio monitor? 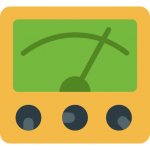 To the uninitiated, a "monitor" may refer to the display device you hook up to your computer so you can interface with its GUI. In the pro audio world, however, when we speak of a "monitor," we are referring to a type of speaker that allows you to listen, in other words, "monitor" your recordings, performances, and song arrangements. A monitor also enables musicians on stage to hear themselves separately from the sounds coming from other instruments and the environment. But for the purpose of this post, we are talking about "studio monitor speakers." What makes a studio monitor special is that it is designed to give an honest representation of your music and recordings as much as possible. Consumer grade speakers, from audiophile speakers to budget stereo speakers, are all designed to make whatever is being played through them sound "good." That means that the manufacturer specifically designs their speakers for the purpose of boosting certain areas of the speaker's frequency bandwidth to make them sound either "brighter," "crispier," "deeper," "rounder," and so on. The unfortunate result in using these kinds of speakers to monitor your studio recordings and music production, is that it will have a negative effect on how you're able to mix and balance your songs. A good studio monitor speaker has what is called a "flat frequency response." This means neither bass, treble, nor any other frequency within the mid-range will be boosted or attenuated. You are then able to mix and master your music knowing that what you are hearing is the most honest sound. If it can sound good on a pair of studio monitor speakers, it will sound good wherever else you play your mixes--guaranteed. You purchase a pair of studio monitors when you want do "critical listening," while consumer monitor speakers are designed for "relaxed listening." If you've never used studio monitors before, when you receive your first pair, chances are that what you hear will, to you, will sound "worse" than the consumer speakers you are used to. Your ears have not become accustomed to the transparent sound of studio monitors. You've become accustomed, instead, to the boosts in the bass and treble, which in consumer speakers give the erroneous effect of "high-definition" and "power." Also, you may need a "break in" time of up to 80 hours to get your monitor speakers to start working the way they should. So don't be discouraged. That said, you won't be hearing any special tweaking by the manufacturers of the studio monitors. You'll hear a flat sound which will be transparent enough for you to spot any blemishes in your mix. The size of the speakers is one of the first considerations in what kind of studio monitor to get. When we talk about speaker size, what we are referring to is the size of the "woofer." They come in various sizes, but each has different advantages that you need to consider for your type of music. Larger woofers, like 7 inches and up, provide a better frequency response in the bass and lower frequencies. 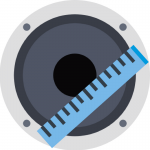 If you know that you will be mixing and mastering music that requires lots of powerful bass and kick to mix, it's a good idea to go with something 7 inches or higher. Then are the more common woofer sizes from 5 inches to 6 inches. These are great if the genre of music you're recording or mixing is not as bass heavy or intensive. Also, a smaller woofer size means a general cheaper monitor. You can get these, and later add a "subwoofer" for more bass when necessary. The power in loudness in studio monitors, and all other speakers for that matter, are measured in "watts." Having a significant amount of wattage in your speakers output is important. Not because you want to turn it all the way up and disturb the neighborhood's cat, but because having enough headroom allows for clear and transparent monitoring of your songs when the music is driving loud. Also, you won't blow out your speakers when you get those accidental loud pops and glitches that can happen from time to time in a home studio, especially when switching gears or changing settings. 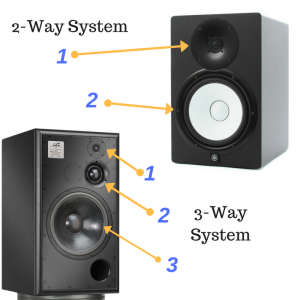 Some studio monitor speakers are configured as either 2-way or 3-way systems. This simply means the amount of drivers they have per channel (left/right) that are covering different separate segments of the monitor's frequency response. In a 2-way system, there will be a speaker for high-end, and one for mid-to-low end. This is the most popular option. They are the cheapest, but you can get some high-end variants of this. 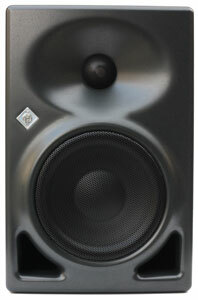 In most 3-way systems, an additional larger driver is used to push the bass and even the sub bass frequencies. This has it's obvious benefits that you have a dedicated subwoofer already, and may not need to add another one. The benefit of have a 2-way, though, is that there is less chance of a "frequency crossover" -- the point where the drivers overlap in frequency response, and the resulting potential interference they can cause. In 3-way systems, there will inevitably be more frequency crossover between the low and mid frequencies, meaning that you'd have to be cognizant of that while mixing and mastering. However, the benefit of a 3-way system is that you may not need to add a subwoofer. While a 3-way system will have some crossover effect, the manufacturer is aware of this and designs the speakers in accord. Adding a subwoofer to a 2-way system may require testing, trial and error, and some research on your part to get the "perfect match" to your 2-way pair. This is one of the most important things to consider and should not be missed. Studio monitors come as either active or passive. Passive means that monitors need to be powered by an external amplifier in order for them to work. This is like your regular speakers that you plug into your stereo. On the other hand, active monitors come with their own built in amplifiers, meaning they don't need external amplification, and the amplifiers are specially designed for the speakers themselves. In this list, all of the choices I've presented to you are active monitors. They are the most popular to choose from because they don't require you to search for amplifiers to match with speakers to get the best results. I referenced this earlier, and probably should have placed this at the beginning. It is another very important consideration. Frequency response refers to how the speakers will be able to transmit sound across the frequency range. To illustrate, most human hearing has a "frequency response" of 20 Hz to 20 kHz (20,000 Hz). That means our ears "respond" to frequencies as low as 20 Hz, which is perceived as a low rumbling sound that is more felt than heard. Our ears can also respond to frequencies as high as 20 kHz, which is so high in pitch it's practically on the verge of silence. 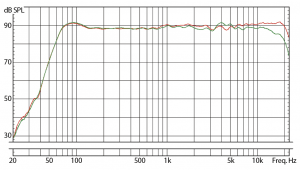 A monitor's frequency response is just the same. The specs of a monitor will say, for instance, that it has the "frequency response" or 40 Hz to 35 Hz, or 32 Hz to 21 kHz. How does this factor into your decision? Naturally, if you know that you will be working with a lot of bass heavy music, you need monitors that will be able to respond to the lowest frequencies. The lower, the better. If you need a lot of clarity in the upper harmonics for acoustically rich music, like orchestra music, film score, or for our drum cymbals, a frequency response above 20 kHz and higher will provide pristine clarity to help you in your mixing decisions. You'd be able to catch and reign in stray frequencies much better. These terms refer to the monitor speaker's ideal listening range. If you are in a small to medium sized room, near and midfield monitors are the best for you. Nearfield monitors provide accurate listening even in a room that needs better acoustic treatment because the sound coming from them interact minimally with your room's space. Hence this is the best option for "bedroom producer" types. Even in larger rooms, nearfield monitors also serve the added benefit giving an engineer or producer a "second opinion" from another set of monitors. Farfield monitors work best in larger rooms, especially rooms that have been acoustically treated. These monitors interact more with your rooms acoustic space, so you get a feel for how your music sounds within a space. Without getting too technical, midfield monitors offer the best of both worlds. You get a large sound stage and stereo image, and large listening sweetspot, and you don't need a very large room for them to work well in. This guide only covers nearfields and midfields, as that would generally be the options both available to purchase online, as well as what you most likely need. Since recording and producing music is your business, getting a good pair of monitors is not going to be something you want to scrimp. You can get some for cheap, sure, but you will eventually pay the price in quality. do you want "truthful sounding" monitor speakers? This kind of compromise may not necessary be an unadvantageous thing for you. If your concern is with mixing and engineering your tracks, then you should get "truthful sounding speakers." You may not like them for hours of listening, but at least your music will translate well no matter where they are played. If your concern is with remaining enthusiastic and inspired while making beats or compositions for hours on end, then get the ones that will "sound great." They will encourage hours of music making enjoyment, while still remaining flat and accurate. Studio monitors that cost 1000 dollars and up for a pair will not compromise. They will both "sound great" and "sound truthful" at once. And they hence tend to be the industry standard choice among engineers and producers who work professionally for long hours both creating, and engineering audio. Keep in mind as well that you want to purchase a "pair" of studio monitors. Many of monitors in this post consist of singles. This means you'll need to add two items to your cart before you purchase. Sometimes, sellers will provide buying options on their site for buying a "pair" instead of 2, which offers a reduction in price. So watch out for that option if you see it in the pages from the links I provided. Of course, you can always get a single if that's what you're looking for. While studio monitors may not seem necessary to the uninitiated, if you ever want to have professional quality sound you’ll have to get at least one. Studio monitors are important because due to the fact that audio can sound different between different devices. With studio monitors, you get a balanced audio that helps you hear all the little details that regular speakers won’t put off. Most beginner music/audio producers often realize quickly that there are many pieces of equipment necessary (or recommended) in the process. Along with audio interfaces, studio monitors are one of the most important investments, and will vastly improve your sound quality. They vary in price ranges, but even a high quality speaker pales in comparison to a cheap studio monitor. Is one studio monitor enough? Depending on what you’re using the studio monitor for, one can be enough. That being said, there’s a reason most audio producers get multiple monitors. When you use multiple studio monitors, you surround yourself with the stereo field and get a better understanding of the smaller details. If you’re just starting out and are on a budget, one monitor will do. Focus on getting all your pieces of equipment in line, then purchase the second monitor when you can afford to do so. Studio monitors are an essential part to the audio and music industry, so the more you have the better. The whole point of having studio monitors (aside from acting as a boosted speaker) is to hear the small details, so don’t limit yourself to just one if you want professional quality sound. How can you connect studio monitors to a computer/laptop? There are two ways to connect studio monitors to a computer/laptop. The first way requires a male to male TRS cable. Take on side of the TRS cable and plug it into the right or left studio monitor, then take the other side of the cable and plug it into the corresponding socket (right or left) on the audio interface in the main audio output. Plug the audio interface into the laptop/computer’s USB/Thunderbolt/Firewire socket, and you’re good to go. The second way to plug a studio monitor into a laptop/computer requires a male TRS to male XLR cable. For this method, plug the male TRS side of the cable into the right or left studio monitor, and plug the male XLR side of the cable into the corresponding (right or left) socket on the audio interface’s XLR female socket. Then, plug the audio interface into the laptop/computer’s USB /Thunderbolt/Firewire socket, and you’re all set. Where should you place studio monitors? There are two ways to set up studio monitors. The first way is a little trickier, and is only done by professional audio/music producers usually. Mount the studio monitors in the wall, with the base of the speaker at the same height of your laptop/computer. This method is much less likely to be used if you’re doing this at home. The second way requires separate stands for every studio monitor you have. It’s important to isolate the studio monitor from your desk, since any vibration can influence the sound coming from the studio monitors. Just like the first option, the studio monitor’s base must be at the same level of the laptop/computer. Make sure your studio monitors form an equilateral triangle, or form a 60 degree angle between you and them. Either option requires you to place the studio monitors about 10 feet from your ears for two reasons. 1) You don’t want to blow your eardrums when testing with new sounds, and 2) you need to hear the quality of the audio from a distance so your ears don’t just hear a mash of different sounds. You can read more about speaker placement in a small room here. How can you protect a studio monitor from getting blown? Since studio monitors are much more durable than regular speakers, they are much harder to blow. That being said, there are a few precautions to take. Never turn the volume on your studio monitor higher than ¾ of its capacity. Also, make sure you keep the gain on your audio input adjusted so you never overload the monitors. While it’s possible to blow the studio monitors, you’ll likely have severe pain in your ear before you ever blow them. Don’t test this theory though, since you likely don’t want to throw that money down the drain. Lastly, prevent any feedback from the microphone. Feedback is when a microphone takes in the sound from your studio monitor and continues to play louder and louder. This is caused from the microphone playing the audio out of the monitors, and continuously repeating the cycle of recording and blaring out. Why is my studio monitor buzzing? There are a few reasons why studio monitors might start buzzing or ticking. One of the most obvious reasons comes from blowing out the monitor. If you play your music or audio too loud, or allow feedback for too long, you can permanently damage the studio monitor. It’s a little difficult to do that though, so the buzzing is likely cause by another source. Always make sure you have the gain adjusted correctly, and check to ensure that you aren’t over-amplifying your DAW, audio interface, or studio monitors. A small adjustment can make a world of a difference. Another possible cause of studio monitor buzzing is microphone feedback. Don’t leave your microphone too close to your studio monitors so you can prevent this from happening. The only other option is a software issue, or a hardware issue with your audio interface. How to tell if a studio monitor is blown? In many cases, a blown speaker will exhibit obvious signs of physical damage–typically a rip or tear in the speaker cone. This prevents the cone from flexing fully in response to transmitted electrical energy, resulting in an apparent buzzing sound. In some cases, there may be no obvious sign of damage, although you can clearly hear that there is something wrong. 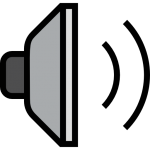 The inability to hear certain frequencies of the audio spectrum is a clear sign that one of the speaker’s elements has malfunctioned, even though the speaker cones appear to be intact. You may also hear a rattling or a deep howling sound similar to feedback, both of which may indicate a blown speaker component. Conditioning, or “breaking-in,” is the act of getting your studio monitors to sound right after you’ve purchased them. Because they are new, they will not sound ideal, it’s a good idea to get them broken in before you do any critical listening or mixing on them. To condition or break in a new studio monitor, you should play pink noise for 24 to 48 hours. Pink noise is basically a mix of noises that have much lower frequencies than white noise. This allows the studio monitor to reach its peak of high and low frequencies, and breaks it in. After playing the pink noise for 24 to 48 hours, try playing multiple different styles of music with varying ranges for a few hours. Then you’re all set. What is a passive studio monitor? Passive studio monitors are generally equipped with passive components that split input signals into different frequency bands. Each band is then directed to a specific driver in the speaker system. Passive monitors are typically driven by high-level signals from external amplifiers, in contrast to active studio monitors that come with built-in amplifiers. This design reduces the cost of producing passive monitors, making them generally less expensive than their active counterparts. In addition, having the amplifier separate from the speaker also enables the mixing and matching of amplifiers and speaker combinations as desired. This makes it possible to obtain specific tonal characteristics simply by swapping amplifiers. 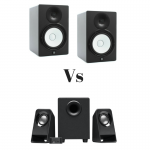 This completes this guide on the best studio monitor speakers you can buy on the internet. Hopefully you would've found the perfect one for yourself. 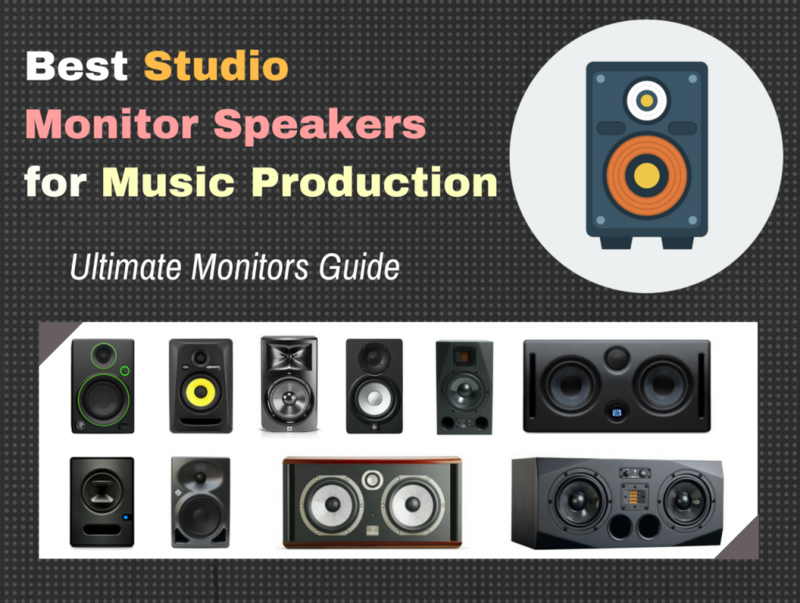 In this buyer's guide, you learned not only of the best monitors out there, but also these various types that exists, their applications, and some very useful specifications that will easy you into a more intelligence buying choice. How did we come to these results? This is the result of hours and weeks of combing through the internet. We dug through forums such as Gearslutz.com, Reddit's r/WeAreTheMusicMakers thread, product reviews, and buyer reviews from pro audio owners, as well as my own personal experience. Products were collected from Amazon and other online stores, and used user reviews, ratings, and buyer experience to tell which studio monitor offered the best satisfaction for the dollar. Compiling this with personal experience where applicable, the result is a list of top studio monitors that will not disappoint. I have the PreSonus Eris E8 and I love them! I would definitely recommend them to any of your customers that are interested in them. For my dollars spent I am a happy camper! You have a ton of great info here, I just wanted to share how I felt, maybe it will help someone that is on the fence! Great choice, Brendon! Thanks for starting off the discussion.